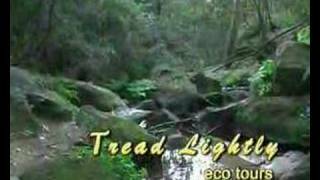 Tread Lightly Eco Tours offer a range of guided walks in the Blue Mountains, a World Heritage wilderness near Sydney. From a few hours to a full day, you’ll explore the region’s spectacular valleys, canyons, caves, waterfalls and forests. An accredited ecotourism operator, Tread Lightly’s guides have extensive knowledge of the Blue Mountains’ geology, plants and animals, Aboriginal culture and astronomy. You can also visit the Jenolan Caves, one of the world’s oldest cave systems. The award-winning Tread Lightly’s walking tours and four-wheel drive eco-tours venture to remote wilderness areas. Night tours provide an introduction to the astronomy of the Southern Hemisphere and the region’s nocturnal wildlife. Tours are available seven days a week. You can also have your tour customised. Tread Lightly is in the town of Medlow Bath, in the Blue Mountains. From Sydney’s Central Station, you can travel by train to Medlow Bath in about two hours.